During a recent get together with my high school friends, we decided to try a fairly new restaurant in our hometown. We had tried coming to this restaurant once before for a lunch gathering only to discover that they stopped serving Saturday lunch and only opened for dinner, so we had to come back during a later get together so we could give this restaurant a try. We were very curious as to how the restaurant would be as this is a location that has seen a number of restaurants come and go over the past number of years and none has ever really been able to stick around. In more recent history, this particular restaurant has actually stayed much longer than its previous predecessors. I started my meal by ordering a Keep it Simple but Amazingly Fresh Salad. According to the menu, all of the salads are described as follows: “Why do our greens taste so much better? “Field to fork” time makes the difference.” Oceans & Earth grows their “Living Salad” only a few miles from the restaurant and the ingredients are harvested every morning. Each of the ingredients are only harvested as much as is needed for each day and the greens and vegetables are brought into the kitchen with their root system still intact which results in “higher nutrient values and superior taste and flavor.” The Keep it Simple but Amazingly Fresh Salad is made with chopped Future Foods farm greens, greenhouse tomatoes, cucumber, shaved onion, feta cheese, mixed micro greens served with farm herb vinaigrette. And like everything else in the restaurant, all of the salad dressings are homemade and organic. The salad was fresh and the flavors were vibrant. The salad was also incredible lite too, but packed a punch in the flavor department. 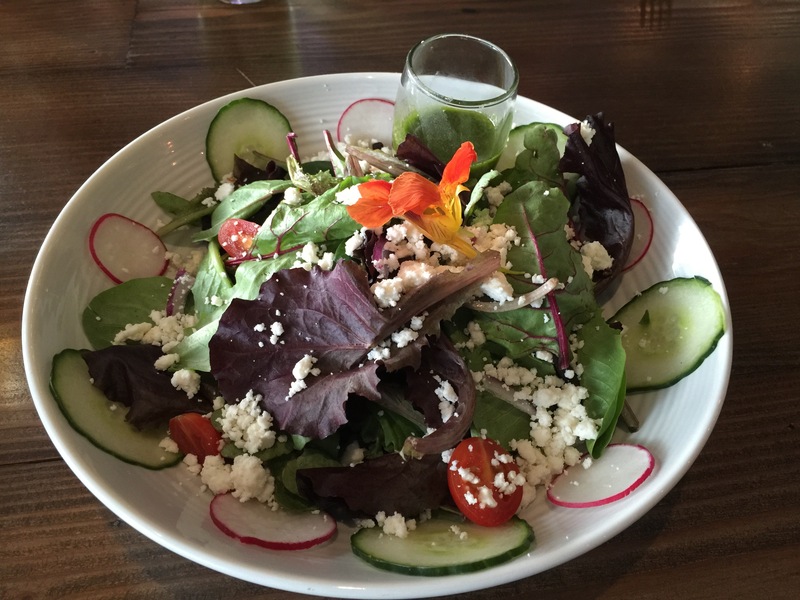 The farm herb vinaigrette was terrific, a little tangy and herbaceous, it was the right combination of ingredients to added to the earthiness of the salad ingredients. The crumbled feta added just the right touch of saltiness to balance out the bite of some of the greens. The crunch of the thin sliced cucumbers and radish added the texture to the salad as well. This was a great start to the meal. For my entree, I ordered Ron Burgundy’s meat & potatoes. Made with burgundy marinated prime skirt steak, it is served with watercress, twice baked potatoes and a burgundy pepper sauce along with an avocado chimichurri. Overall, my entree was just ok. There was nothing on the plate that absolutely wowed me and for how beautiful the salad course was, I felt that the plating of the food on my dish was pretty mediocre. 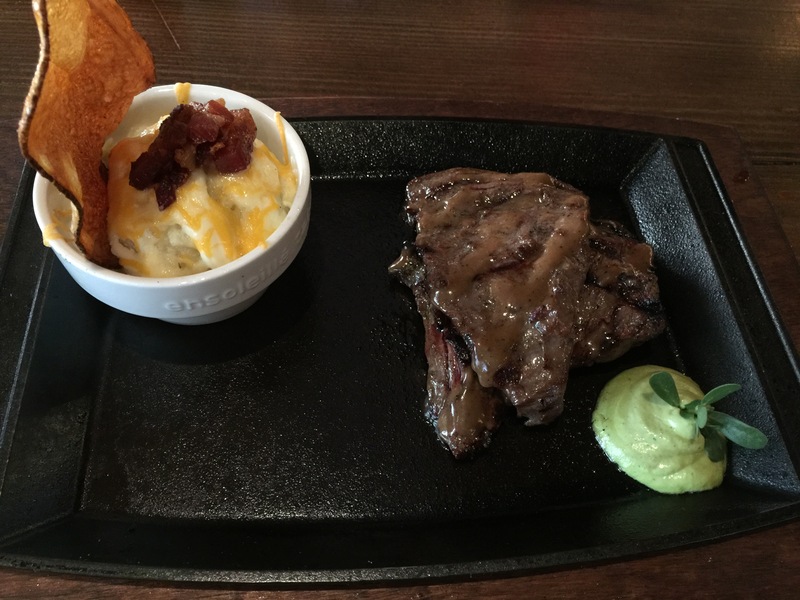 It almost felt like my skirt steak and twice baked potatoes were intended to be separate courses based on how they were plated on the dish. There felt like there was no cohesion between the different ingredients, and the avocado chimuchurri almost felt like it was thrown on there at the last second without any idea of how it fit as an ingredient with any of the other items on the dish. The twice baked potatoes were pretty good, very creamy and smooth and a good amount of melted cheese and bacon crumbles sprinkled on top. Unfortunately, I think that much of the creaminess of the potatoes came from sour cream that was mixed into the potatoes, so that was a bit of a turn off for me and I wish I would have known that the potatoes had sour cream on them. The skirt steak itself was a little tough, tougher than I had expected it to be. The burgundy sauce and marinade on the steak was delicious and the steak itself had a nice grill/char flavor. But overall, the dish was just lacking a little bit and I was slightly disappointed. Finally, I went back and forth as to whether or not to order dessert, but ultimately, I just couldn’t say no to the bananas, so I ordered the chocolate, chocolate chip banana seashells. This dessert was huge, much more than one person could finish. Luckily, I had some friends with me that were more than happy to help me finish off my dessert. Made with chocolate, chocolate chip banana seashells, bananas foster, and house churned vanilla bean ice cream, the dessert wasn’t nearly as decadent as it sounded, which was a good thing. When it came out and I saw these 3 chocolate cakes, I thought it would be over-the-top sweet, and it wasn’t. The cakes were really more like light, airy madeleines, which where perfect. The cakes were semi-sweet and topped with bananas foster which added a nice warm, cinnamon and nutmeg flavor. 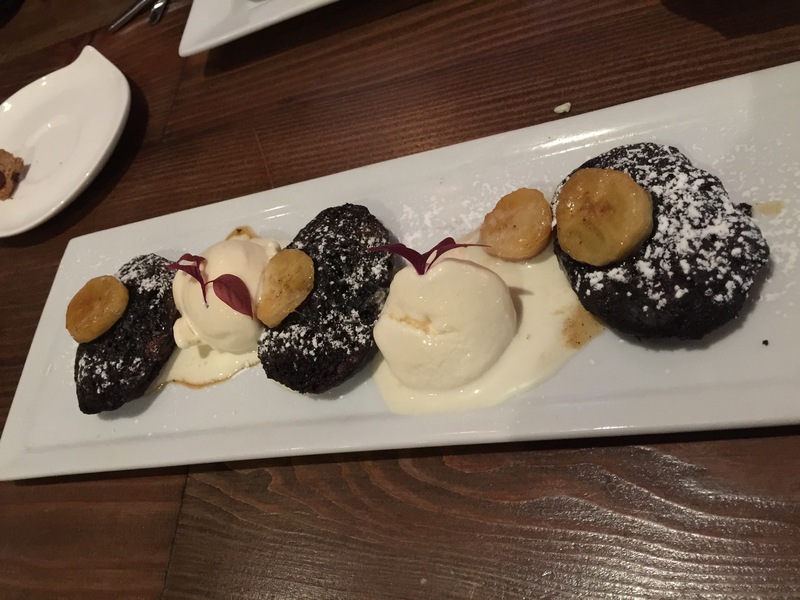 The combination of the chocolate cake with the sweet bananas and the cool and creamy homemade vanilla ice cream was a terrific pairing. The vanilla ice cream did taste homemade as it was creamy and rich and had the right balance of vanilla to balance out the chocolate and the banana. This delicious dessert was definitely more than enough to make me forget about my mediocre entree dish. The concept of Oceans & Earth is a terrific one – local, sustainable, homemade, created-from-scratch food. The fact that this restaurant exists in my hometown was one that had my friends and I excited. At times, the execution of the food was spot on, and the tastes of the fresh ingredients was incredible, and at other times, execution fell a little flat. While I understand that all the food is made fresh and as ordered, that also meant that even though we were one of the first guests to arrive at the restaurant, it took an inordinate amount of time for our entrees to be prepared. It made us wonder how all the tables that arrived after us would be served it if it took close to an hour just to prepare our meals. So, in that respect, my friends and I were a little disappointed. All in all, I think we all walked out of the restaurant with mixed emotions. Our meals all started strong and finished strong, but some of the menu items as well as our entrees all left a little to be desired. Before we left for dinner that night, one of my friend’s mom’s had remarked that she had eaten at Oceans & Earth and she found it a little bit odd and different, and now having dined there myself, I can see where she was coming from. 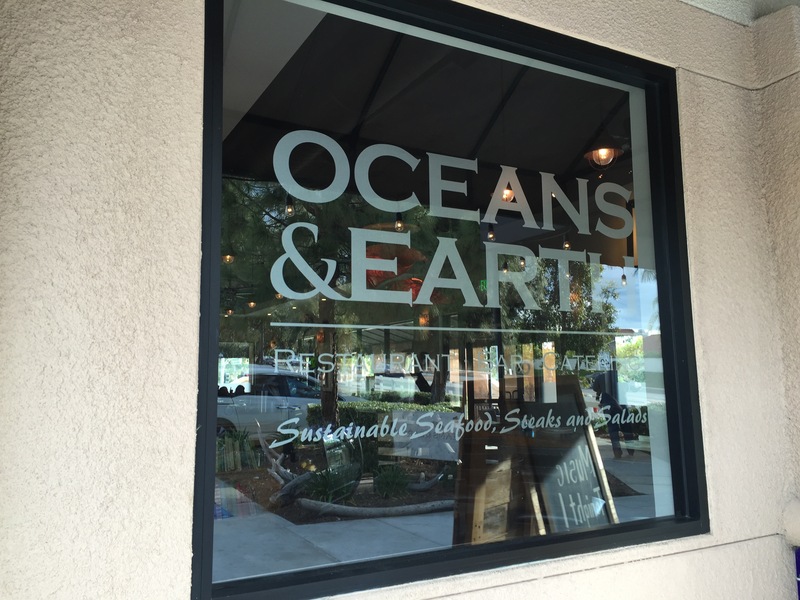 Oceans & Earth is different than any other restaurant that can be found in the area, but the concept and execution of their mission can use a little bit of work. I won’t rule out dining there again, but probably not any time in the near future.